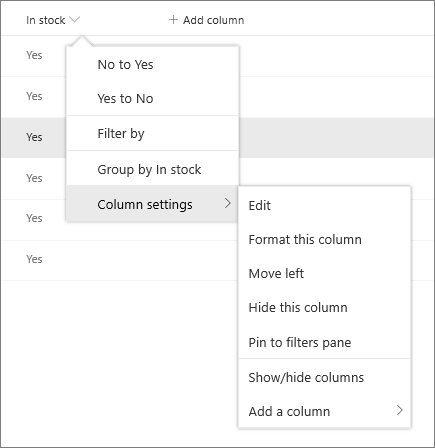 You can change the settings, such as the name, for a SharePoint column in a list. Depending on the type of column and the type of list, you can make additional changes, such as how much text a user can enter, or which columns to show or hide. You can also change the order in which columns appear in a list. For example, in a product list, you might want to change the item number or price's position in the list. You need Edit permission level or higher to edit a column. Note: Does your screen look different than the examples here? Your administrator may have classic experience set on the list, or you're using an earlier version. If so, see Change a column in a list or library. If you're a list owner, site owner, or administrator, see Switch the default experience for lists or document libraries from new or classic for the steps to set the default experience. Open the SharePoint list you want to work with. If you can’t find the list, in SharePoint, click Settings , click Site Contents, and then open the list. 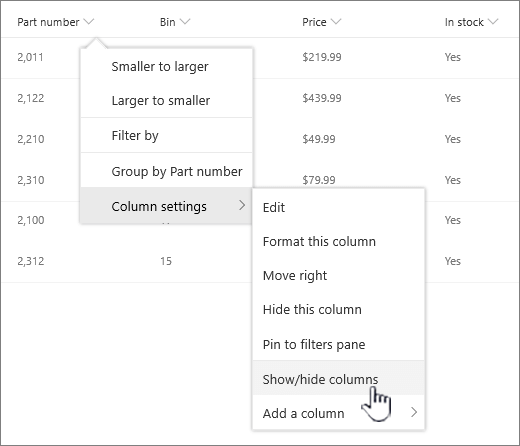 If you want to change the order of columns in something other than the default view, click View options and choose a view. The name displayed in View options is the name of your current view. By default it's All Documents. Hover and click the down arrow on any of the list headings, and then click Column settings>Show/hide columns. 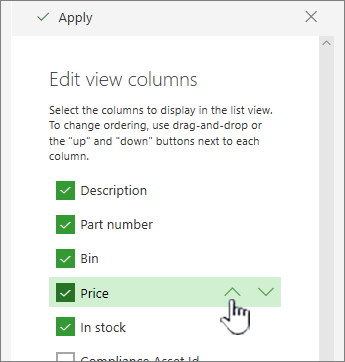 Drag and drop columns up or down to put them in a new order. You can also use the Up or Down arrows that appear when you hover over a column. 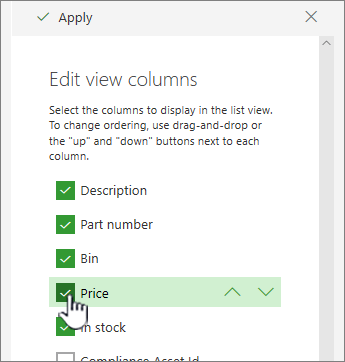 Repeat step 3 to change the order of all columns you want, and then click Apply to save. To save the view, click View options and then click Save view as. Update the name if you want, and click Save. If you want to show or hide columns in a view other than the default view, click View options , and choose a view. The name displayed in View options is the name of your current view. By default it's All Documents. In the Edit view columns dialog, select or clear the columns you want to show or hide. You can also change other settings for columns directly from the column settings dropdown menu. If you want to change columns in a view other than the default view, click View options , and choose a view. The name displayed in View options is the name of your current view. By default it's All Documents. Click the arrow next to the column that you want to change, and then select Column settings. In the menu, select the change that you want to make, such as formatting the column, moving left or right, hiding, or adding a column . The settings vary depending upon the type of column you are editing. For more information, see Site column types and options and Edit a rich text, list column in SharePoint Online.